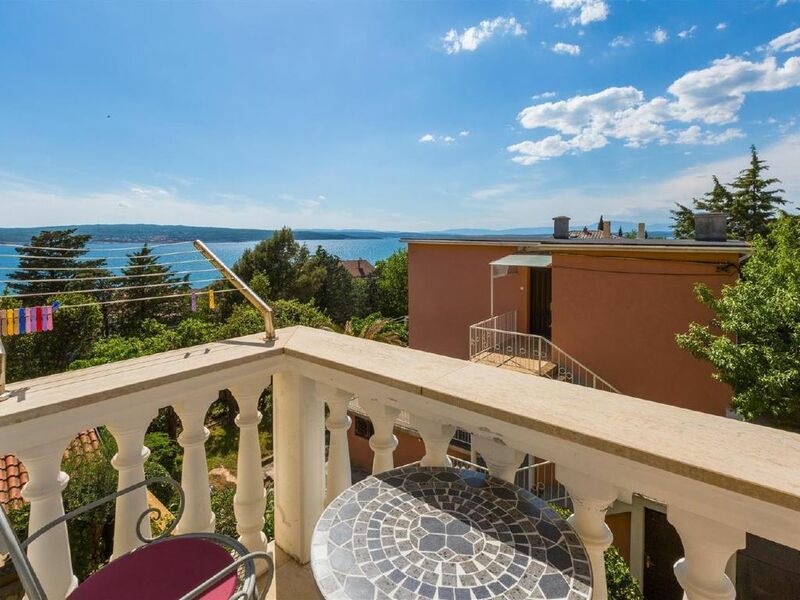 Apartment for 4 people in Crikvenica, 46 m², 2nd floor, number of bedrooms: 2, Bathrooms: 1, with a balcony, ideal for children, garden, ocean view, partial ocean view, App with air conditioning, well equipped, with satellite TV, barbecue. Dining room and kitchen are one room, tiles, with satellite TV. Kitchen, dishes available, kitchen towels, electric cooker, number of rings: 2, refrigerator with a freezer, coffee machine. 1: double room with double bed, parquet. 2: double room with double bed, parquet. Bathroom with toilet, with shower. own balcony, with sea views, seating available, shared terrace. Garden for use, barbecue available, parking in the yard, Pets allowed, per day: 6. 00, air included in the price, owner lives in the same house, bed linen available, towels available. Restaurant, café, hairdresser, beauty salon, dance cafe, discotheque, casino, souvenir shop, supermarket, shop, boutique, tennis court, beach volleyball, water skiing, paddle and rowing boats, diving, bicycles, mopeds, bowling alley, table tennis, car hire on site, Bicycle rental, deck chair and parasol rental, water slide for a fee, wellness center.